The KONG Dynos are brightly-coloured snuggly toys for your dog. The toys have the shape of dinosaur. The different textures, the squeak and crinkly sounds make the toy irresistible! 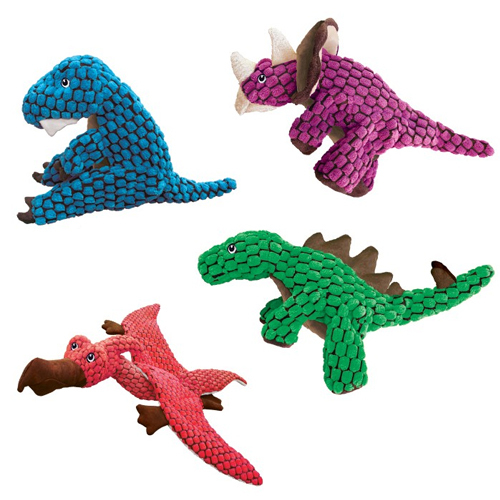 The KONG Dynos are available in four different characters: T-Rex (blue), Stegosaurus (green), Triceratops (purple) or Pterodactyl (red). Playing is good for your dog! It keeps him active and challenges him. The KONG Dynos Dynos are colourful and snuggly toys for dogs. The toys have the shape of a T-Rex, Stegosaurus, Triceratops, or Pterodactyl and have different textures, which makes them ever more interesting. The lining is made from extra strong material for longer fun. The added squeak and crinkle sounds make the toy irresistible. KONG Dynos are available in four varieties: T-Rex (blue), Stegosaurus (green), Triceratops (purple) of Pterodactyl (red). They are available in two sizes: small and large. Have you used KONG Dynos before? Let us know what you think about this product. Kong Dynos are amazingly tough toys. Our terrier normally shreds his toys in a day. Kong toys can last weeks, even months. Fabulous.